One of America’s most interesting cities is New Orleans, Louisiana. Louisiana was a French colony for over 120 years and this influence is felt to this day. New Orleans is a melting pot of French, Spanish, Native American and African cultures and has a very distinct identity from most other American cities. Nearly ten years have passed since Hurricane Katrina badly damaged the city. The city has rebuilt itself from that tragedy and is now buzzing with energy and attracting tourists from across the world. The best time to visit New Orleans is during the famous Mardi Gras celebrations – this year happening on February 17. Start planning your trip and getting your ESTA authorization soon to enjoy this magnificent city and its legendary carnival – the Mardi Gras! A visit to New Orleans should begin in the city’s famous French Quarter. The Great New Orleans Fire of 1788 destroyed much of the old French Quarter and its typically French architecture. As a result, the current architecture is from the late 18th century and is Spanish colonial architecture – reflecting Spain’s dominion of Louisiana at the time. Most buildings have very attractive facades with beautiful and ornate ironworks in their balconies. The main street in the French Quarter is Bourbon Street. Famous for its bars and parties, Bourbon Street is the heart of the French Quarter and one of the main streets for the Mardi Gras carnival celebrations. During Mardi Gras, a parade passes through the street and people throw colorful necklaces from the balconies of buildings. People wear colorful costumes and the atmosphere is of joy and fun. 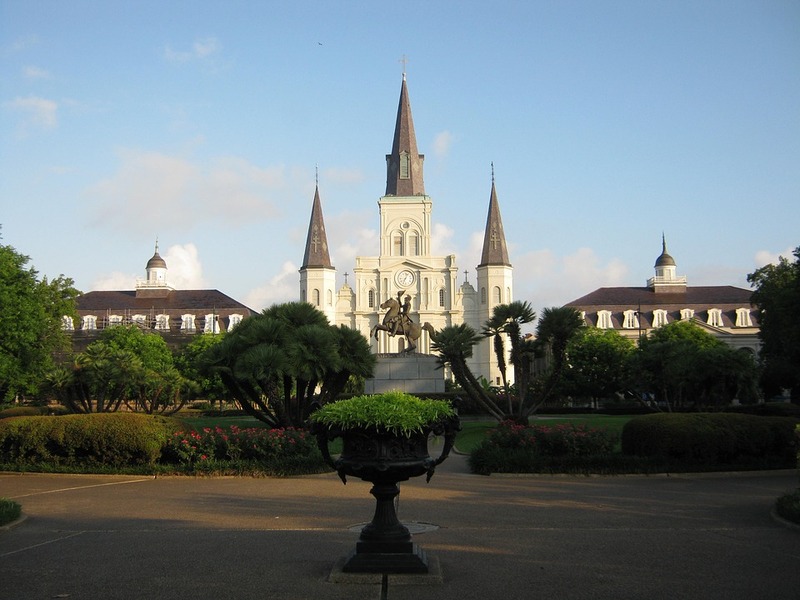 Another top attraction located in the French Quarter is Jackson Square. At the middle of the square is an attractive statue of President Andrew Jackson – after whom the square is named – riding a horse. Behind the statue is the city’s cathedral, the St. Louis Cathedral. The cathedral was built in 1789 and is a very attractive white building. To the left of the cathedral is the Cabildo, originally the city hall and now a museum. The Cabildo was built between 1795 and 1799 and was the seat of New Orlean’s colonial government. To the right of the cathedral, is the Presbytere – built in 1793 to match the Cabildo. Jackson Square is very photogenic and pleasant to walk in. Within walking distance from Jackson Square is Canal Street, one of New Orleans’ most emblematic streets. Canal Street has major shops and New Orleans’ famous street-car or tram covers large part of the street. Canal Street intersects with St. Charles Street. St. Charles Street is home to New Orleans’ most attractive mansions, built in the graceful and attractive southern style. St. Charles Street also has an old street-car and continuing uptown on the street leads to two New Orleans famous attractions: Audubon Park and Tulane University. New Orleans is synonymous with good food and no visit to the city is complete without enjoying its famous creole cooking and fresh Gulf of Mexico seafood. Some renowned restaurants include Arnaud’s and Antoine’s – both offering Creole dishes and are located in the French Quarter. Some of the most famous Creole dishes include Po-Boys, overstuffed sandwiches with roast beef, fried shrimp, oysters, catfish, or soft-shell crab. Another very popular Creole dish is Gumbo, a rice stew served with okra (a vegetable that is part of the mellow family), seafood, chicken or sausage. A perennial favorite is Crawfish Etouffe. Crawfish or crayfish is a type of freshwater lobster. The dish is stewed and served over rice similar to Gumbo. If you’re looking for something sweet then beignets are the answer. Beignets are similar to doughnuts – fried dough that is covered with sugar but without the hole. The most famous place in town selling beignets is the Café du Monde located right on Jackson Square. New Orleans is an American city that should not be missed. It is one of America’s most interesting and lively cities. Almost ten years have passed since Hurricane Katrina heavily damaged the city, but New Orleans has heroically rebuilt itself and has resurrected that joie de vivre it has always been so famous for. Visiting during Mardi Gras offers the opportunity to witness one of America’s most unique and fun festivals. Hurry and get your ESTA authorization soon so that you are able to enjoy Mardi Gras and all of the other attractions and wonderful cuisine New Orleans has to offer!